Written for Wild Oats Natural Foods, Bristol. You can find the original article on their website here. 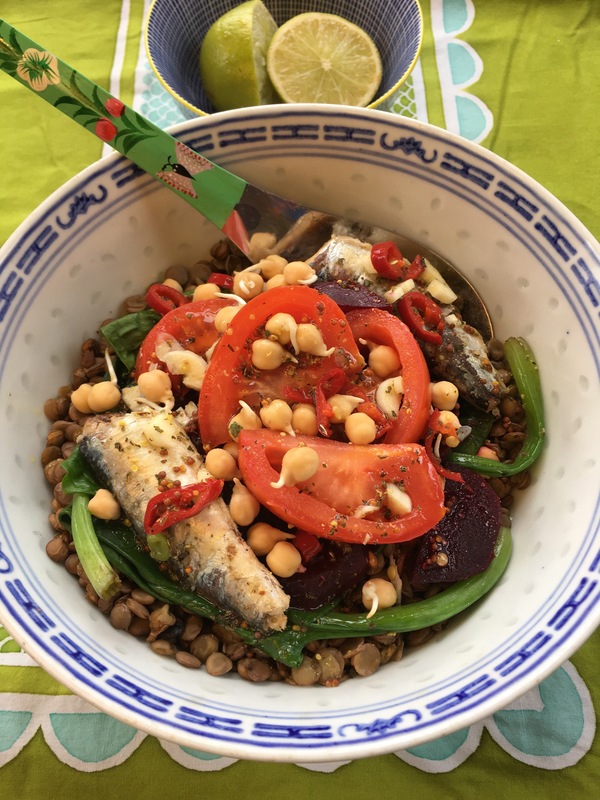 Puy lentil salad with sprouted chickpeas and sardines; the perfect fresh dish providing protein, antioxidants, nutrients and good fats for glowing skin. You can find my recipe here. The skin is an organ, the biggest organ of the body, and it needs to be supported and nourished to keep it functioning properly. It has to deal with a lot –atmospheric toxins, heat regulation, sun exposure and it acts as a barrier to protect our precious insides! Skin health can be a difficult subject to discuss for the person suffering, as for some people their skin issue may be visible and therefore embarrassing to talk about. It can create great stigmas, unhealthy habits and discomfort -affecting the person socially, mentally as well as physically. This can leave the person psychologically and physically tired, which unfortunately will only exacerbate the issue further. There is a wide spectrum of skin problems including acne, dermatitis, psoriasis, shingles, cysts and eczema and in all these cases it could be said that the infection is trying to make it’s way out of the body -using the skin as it’s route of elimination, and for that reason it is important to maintain total body health for ultimate skin health. ✔️ Water intake – make sure you’re getting enough water to help flush out toxins and hydrate your system; drinking herbal tea can also be a great, therapeutic way of staying hydrated. ✔️ Sleep – at least 8 hours a night and switch off electrical devices before you get into bed. ✔️ Organic and natural skincare products -there’s ample to choose from at Wild Oats! ✔️ Supplements – vary depending on the person, but a multi-vit and an Essential Fatty Acid are the basics. Herbal supplements can also greatly reduce skin issues. ✔️ Sunshine – seek an organic/natural face and body cream that contains a Sun Protection Factor (SPF) for the summer. Zinc Oxide and Titanium Dioxide are natural active SPF ingredients to look out for. Aloe Vera also has natural SPF of 5. ➖ Caffeine and alcohol – both are dehydrating for the body and stimulating for the liver -impacting the proper functioning of the liver which can lead to a build-up of toxins in the body. ➖ Processed food and refined sugar -Reduce acidic and inflammation causing foods like including fried food, margarines and fast-foods as well as refined (white) sugar products. ➖ Dairy -dairy can clog the system and introduce pathogens to the body which are an added burden for the system to process. The possible exceptions of dairy products are kefir (cultured dairy), organic live yogurt and organic butter. ➖ Decrease stress – Skin issues are stressful enough, let alone any external stress added on top! Stress creates a chemical reactions in the body that makes skin more sensitive and reactive, making the healing process slower. Hormones such as cortisol are released under stress which results in increased oil production by sebaceous glands, making the skin more prone to acne and other skin problems. Spring is the perfect time to cleanse the system from the rich foods that we indulge on during the colder months, and awaken the body from increased stagnicity (hibernation!). Some simple ways of kick-starting a cleanse is to focus on what you’re putting in your body, and giving your body the food it needs to maintain the perfect glow. For ultimate skin health it is important to eat fresh, alkalising and nutrient rich food. We use toiletries to make us look good, feel good and smell good, but do we really need as much as we use to achieve the required end result? “your skin absorbs up to 60% of the chemicals that come into contact with it and sends them directly into the bloodstream” . Your skin has to deal with a lot: environmental toxins, as well as any chemicals used on a daily basis – deodorant, makeup, soap, perfume and household cleaning products -so why not lighten the burden and try reducing the amount you use? After all you may not need an extensive facial routine to create the result you want, minimise and select more specific products. And what’s more as your skin regains its natural healthy look you may find you choose to rely less on make-up. Natural and organic products will be gentler on your skin, more hydrating and healing, plus it is less for your bloodstream to have to process. Acupuncture -derived from Chinese medicine, fine needles are used for therapeutic and preventative use. Colonic Irrigation -cleanse and hydrate the bowel and colon to support whole body detoxification. Skin Deep, Pat Thomas, page 4.